Three Chantry Barns, Orford is a high quality bespoke conversion of an 18th century barn that once formed part of Chantry Farm. It is in a quiet corner of town, a stone’s throw from Orford’s famous castle and on a delightful path to the River Ore and Quay. Orford town centre is a minute’s walk away, where you will find Ruth Watson’s renowned eatery, The Crown and Castle, as well as the Kings Head and Jolly Sailor pubs which serve good food, an artisan bakery and a lively village store and café. This semi detached property has been lovingly converted with the original beams and a solid oak staircase contributing to the property's character, while meeting all of the modern needs we have today. Upon entering you will find yourself in a small entrance hall where you can hang your coat and store your footwear. 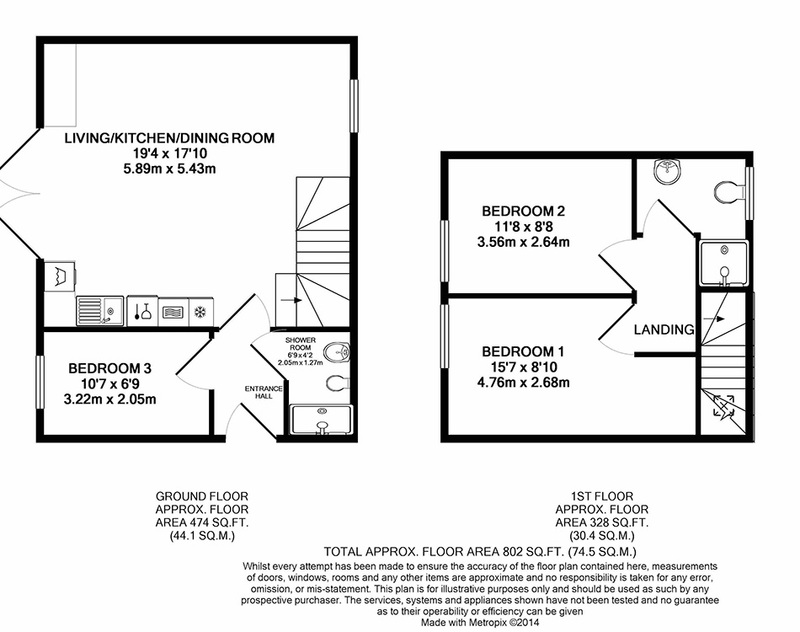 On the ground floor there's a spacious yet cosy kitchen/dining/living room, a bunk bed room and a shower room. An angled staircase leads to the first floor where you will find two bedrooms (king and twin) and a shower room. There is a private west facing patio with view of the castle and communal garden which is rarely used by the neighbours. Guests have use of an allocated car port close to the house, with additional off road parking for a 2nd car.. GROUND FLOOR - There are steps from the car port which lead to the front door and guests enter into a small entrance hall where coat hooks and a shoe rack are conveniently awaiting your arrival. This leads to the living/kitchen/dining room, the downstairs shower room and a bunk bedroom. LIVING/DINING ROOM - The open plan kitchen and dining area, with oak flooring throughout, creates a good space for sociable cooking and eating with a table and six chairs. Glass French doors open from the dining area onto the private patio with communal garden adjacent, ideal for al fresco dining! The kitchen area has laminate worktops and the integrated appliances include a fridge with freezer compartment, dishwasher and washer/dryer in addition to the microwave, electric hob and oven. The sitting area has two sofas, nest of tables, a hi-fi system, an iPod docking station to play all of your favourite music, a flat screen TV with Sky Freeview channels, BT Sport and a DVD player. In addition there is a little bistro table and chair and a well stocked built in cabinet with plenty of books, CDs, DVDs and games to while away the time as well as WIFI. BEDROOM 3 - This small carpeted room with long window overlooking the garden, has bunk beds with full size single mattresses, pine chest of drawers, a hanging shelf. SHOWER ROOM 1 - This room with vinyl tiled floor has a shower cubicle, hand basin, WC and heated towel rail. FIRST FLOOR - Oak stairs lead up from the living room to a landing with linen storage cupboard and doors opening to the other two bedrooms and second shower room. BEDROOM 1 - The master bedroom, fully carpeted and with oak beams, is at the side of the house with west facing window overlooking the neighbouring working farm and countryside beyond. There is a king size bed, one wood bedside table with lamp, floor lamp, chest of drawers, a sweet little rocking chair, double wardrobe with hanging space and drawers. BEDROOM 2 - The second bedroom, also carpeted, and overlooking the farm and fields, has wood framed single beds, a single wardrobe with shelves and one bedside cabinet with a lamp. This charming room also has a vaulted ceiling showing oak beams and is great for children and adults preferring twin beds. FAMILY SHOWER ROOM - The modern shower room is complete with contemporary fittings and has a walk in shower, hand basin, WC, heated towel rail and a built in cubby hole ideal for those toiletries. The window is quite high and overlooks an 'inner courtyard' which gives natural lighting to the room. OUTSIDE - French doors open from the dining area onto a private patio with table and six chairs, perfect for an awakening oudoors breakfast or a refreshing evening drink! There are communal grounds around Chantry Barns, however the garden with lavender border which is adjacent to the patio is hardly used by other residents and guests but please be mindful of your belongings and pets. The owners have thoughtfully provided a metal stake with 20 foot lead which will allow your dog some freedom in the garden and access to the living area if the French doors are open. There is a car port allocated to the property with steps up to a patio leading to the front door and the private patio for Three Chantry Barns. Additional on-road parking is also available nearby. All prices include bed linen and towels, heating and electricity plus a welcome bottle of wine and biscuits to help you get your break off to a relaxing start. The property is attached on one side to another holiday home, and is equipped with individually controlled electric convector wall heaters throughout (also with individual controls). There is Wifi, an iPod docking station, a flat screen TV with FreeView channels, BT Sport and DVD player in the living room. There is an electric hob and oven, dishwasher, fridge with a small freezer compartment, microwave and washing/dryer machine. A travel cot, high chair and stair gate are available on request at the time of booking from the owner of the property. Three Chantry Barns is situated in the delightful village of Orford which is on the River Ore and boasts a 'English Heritage' Norman castle and a working river quay that serves sailors, fishermen and sightseers. The village has a fantastic choice of places to eat and drink including The Trinity at the Crown and Castle and Kings Head pub, the Butley Oysterage, The Jolly Sailor and a café by the quay with lovely views over the river. Across the river is the National Trust's Orford Ness, the site of mysterious research projects in the 1950's and 60's but now a nature reserve. A well behaved dog is welcome downstairs and must be on a leash when in the communal grounds at all times; a 20-foot lead with stake in the ground is provided by the owners. If you wish to bring a dog it must be mentioned at the time of booking on the booking form and is subject to our terms and conditions. Guests are also asked not to wash dog bedding in the washing machine. Pets are not allowed on the furniture. Whilst dogs are welcome, cats are unfortunately not accepted due to owner allergies.